With the demand for healthier options a growing reality around the globe, the Durham Ranch team embarked on a reconnaissance mission to Hawaii to spread the word about bison as a protein alternative. 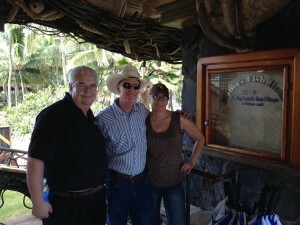 They met with long time Executive Chef Perry Bateman of the famous Mama’s Fish House on Maui’s north shore. Chef Perry serves over 30,000 meals a month and was eager to hear about the health attributes of bison meat and sustainable ranching on Durham Ranch. In total the mission encompassed visiting with chefs and managers from multiple properties on Maui and Oahu, as well as our distributor friends at VIP. Each visit was met with a great deal of enthusiasm about the Durham Ranch and the possibility of using bison meat on their menus. When combining healthy and sustainable, Durham Ranch Bison is an excellent choice! Photo: Maui Jim/aka “Uncle Buck”, Gaylynn and John working hard on Maui!